FAQ and Articles - How to Place an Order? HomeFAQ and Articles	How to Place an Order? 1. In order to correctly select the screen, you need to know at least the BRAND and the MODEL of the laptop. 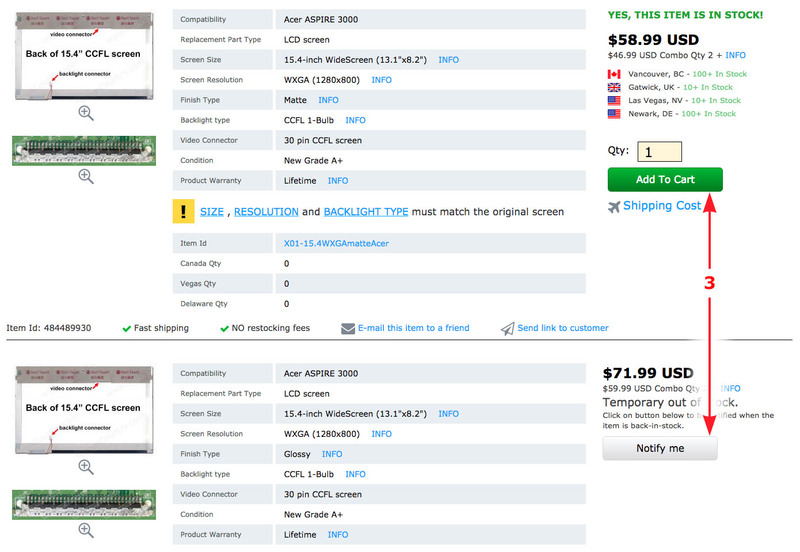 For example, for the Acer Aspire 3000, Acer - a manufacturer, and Aspire 3000 - is the name of the laptop model. 2. Click on the manufacturer and you will see a list of all models available in our stock. Select your model and click on it. Next you will see a list of the screens with the description of the parameters. WARNING! Usually there is more than one model/type of a screen for each laptop model, so before purchasing, make sure that the new screen is the same size, resolution, connector type as the old one. If you are not sure about something, please contact us (the "Support" -> "Create a new ticket"). 3. 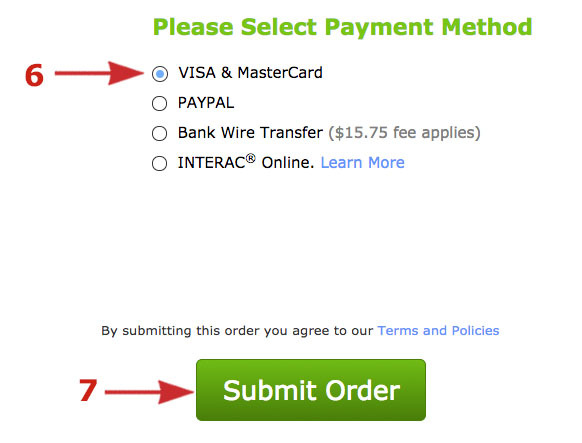 Once you are sure that you selected the correct screen, select the quantity and press the green "Add To Cart" button. If you see a gray button "Notify me" it means that this screen is currently not in stock. Click on it and type in your e-mail to receive automatic notification when the screen appears in-stock. 4. On the next page you will see your shopping cart. If you are buying from us for the first time, you will need to register an account to place an order. This process takes less than a minute. 5. 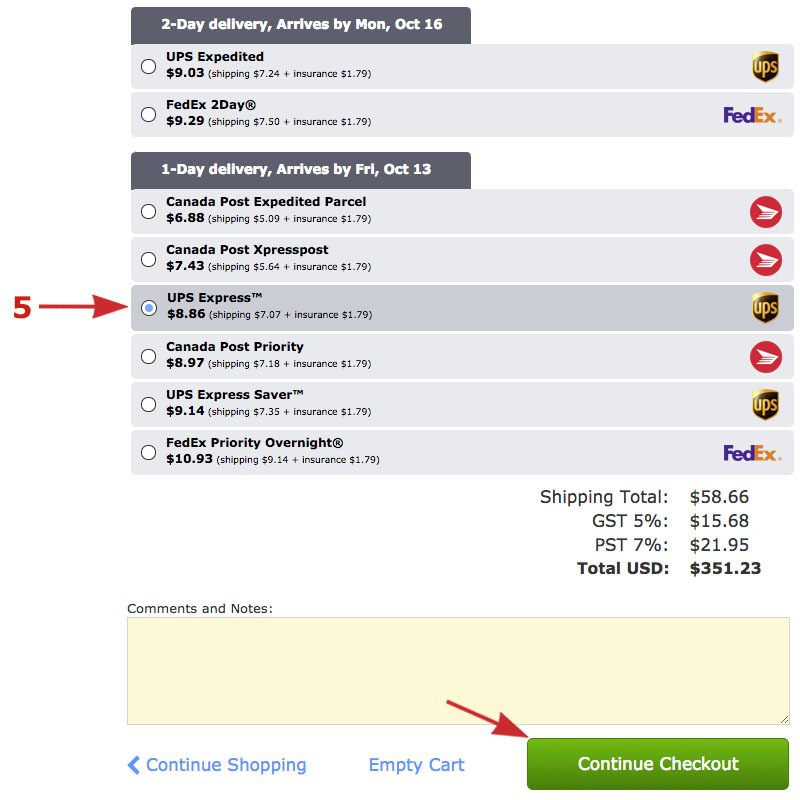 Choose a shipping method and press Continue Checkout button. Find out more about shipping within Canada, U.S., International. - Paypal: click on the Paypal button and you will be redirected to Paypal, to complete the payment. An e-mail will be automatically sent with all the details to the address provided when you registered the account. - VISA or Master Card: you will need to enter credit card information and Billing Address (place where you get your billing statements). - Bank transfer (Wire Transfer): you will get payment instructions to your e-mail. 7. Click "Submit Order" (to confirm the order). We will ship your order the same day, if it was placed before 13:00 (1pm, Pacific Standard Time), Monday through Friday. Otherwise, it will be shipped the next business day.